As valuable members of the pharmacy team, pharmacy technicians work under the direction of a licensed pharmacist. They work in hospitals, community pharmacies, retail drug changes, long-term care, home-infusion pharmacies, and non-traditional settings, such as insurance and pharmaceutical companies. 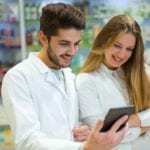 Their role and responsibilities depend on the setting, but common responsibilities include receiving and preparing prescriptions for dispensing, assisting customers over the phone or in person, mix, measure, weigh, and pour medications, label and give instructions to customers, take payments, maintain proper storage for medication, and clean and maintain equipment and work areas. Job growth for pharmacy technicians is expected to increase 9 percent over the next decade, so pharmacy technician students can expect to find employment upon graduation. Graduates how sit and pass the national Pharmacy Technician Certification Exam offered by the Pharmacy Technician Certification Board (PTCB) will earn the Certified Pharmacy Technician (CPh T) credential. 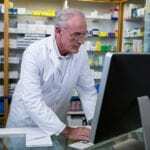 New Jersey pharmacy technicians must register with the State Board of Pharmacy. Mercer County Community College facilitates a 250-hour pharmacy technician program to prepare students for success on the Pharmacy Technician Certification Board’s national exam. The curriculum covers the knowledge and clinical skills to be eligible for entry-level employment in a retail and hospital setting. In addition to classroom lectures, students will also participate in a supervised externship in a variety of settings. The curriculum is divided into four modules: modules I and II will be completed in the fall and III and IV in the spring. Course topics include introduction to pharmacy, pharmaceutical dosage forms, sterile products, pharmacology, pharmacy calculations, and pharmacy practice. The total cost for tuition (4 modules) is $2,877.00. Instructors emphasize the “Top 200” drugs and the development of clinical skills. Theoretical concepts are reinforced through practical experiences in a simulated lab and an internship in a real-world setting. In addition to the pharmacy-related topics, students will also learn resume writing and interview skills through a workshop designed to help them succeed in a career search. Classes meet on weekday evenings for approximately 4 months. Instructions for completing the background check and other requirements will be provided via email after registration. Tuition costs $1369 and includes the PTCB exam fee. Adults completing the pharmacy technician program at AIMS will receive a Pharmacy Technician Certificate of Completion. Graduates will be eligible to take the Pharmacy Technician Certification Board exam to become a Certified Pharmacy Technician. The curriculum will cover areas such as drug administration, pharmaceutical terminology, drug classification and pharmacy management. Students must complete the clinical component of the program, which comprises of 120 hours of practice in a real-world setting. Under the direction of a licensed pharmacist or technician, students will develop practical skills that will help them succeed on the job. The pharmacy externship will begin after the student completes all the required classroom and lab hours. The clinical hours will depend on the availability of space at the affiliated site, but will generally take place during normal business hours. Classroom and lab sessions are offered on a day or evening schedule. The day program runs for 3 months and the evening program can be completed in 4 months. The entire program is 220 clock hours – 100 hours in the classroom and 120 at the clinical site. Contact the school’s admissions department to find out more about tuition and financial aid. Pennco Tech’s pharmacy technician program gives students a foundational preparation to enter the field of pharmacy. Students learn the basics of pharmacy calculations, pharmacology, pharmacy terminology, the effects of drugs on the body, confidentiality and ethics, and prescription processing. Students also learn communication and interpersonal skills, management of inventory, manage and update patient profiles, billing and administration, sterile compounding, aseptic techniques, and how to count, measure and pour medications. Through a 180-hour pharmacy externship students will have the opportunity to apply the skills and knowledge obtained in the classroom to a real-world setting. Graduates will be prepared to practice within the highest standards of professionalism with an emphasis on patients’ well-being and safety. The entire curriculum covers a total of 900 hours. Tuition for the program is $11,050. Books and supplies cost an additional $700.